Highly sensitive Flame Ionization Detector (FID). Detection: Methane, Carbon Monoxide, Non-Methane Hydrocarbons and Carbon Dioxide. The Peak Performer 1 FID uses a highly sensitive Flame Ionization Detector (FID) which has been designed specifically for process applications in UHP gases. The FID is used to measure trace impurities down to part per billion levels, while offering a wide linear range for simple, accurate measurements. The PP1 technology has proven to offer a more cost-effective and user friendly alternative to other instruments for similar applications. In addition, Peak Labs practical experience and ability to customize to suit your applications makes Peak Labs your partner, not just your supplier. Please contact us at Peak Laboratories or your local sales representative for custom applications and further information on our standard applications. All performance specifications are based on fully optimized PP1 FID with 5 cc sample loop on continuous analysis. 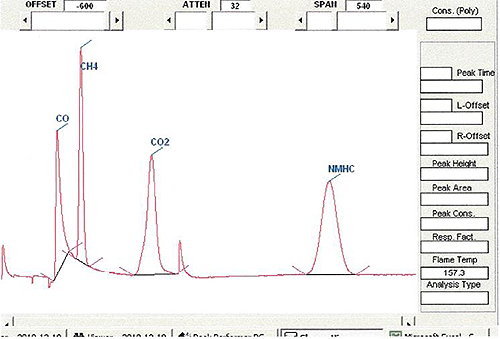 Sample : Total Hydrocarbons, Carbon Monoxide & Carbon Dioxide within Hydrogen matrix gas.